Waterloo Day is celebrated by some regiments of the British Army on June 18. 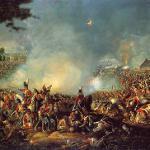 It commemorates the Battle of Waterloo in which the armies of the Seventh Coalition defeated Napoleon's troops. During the War of the Sixth Coalition, Napoleon was captured and exiled to Elba, a small Mediterranean island. However, he managed to escape and returned to France in March 1815. On March 20 Napoleon returned to Paris. So began the period of his reign which is referred to as the Hundred Days. Members of the Seven Coalition prepared to resume the war to end Napoleon's rule one more time. In June 1815, Napoleon gathered enough forces and decided to attack. His forces fought the allies at the Battle of Waterloo that took place on June 18, 1815 near Waterloo in the United Kingdom of the Netherlands (present-day Belgium). The army of allies included the armies of the United Kingdom, the Netherlands, Hanover, Nassau, Brunswick, and Prussia. It was led by Gebhard von Bluecher and the Duke of Wellington. Wellington's Anglo-allied army made a significant contribution to the victory of the Seventh Coalition. Waterloo Day is typically celebrated in the British Army with military parades and reenactments of the famous battle.